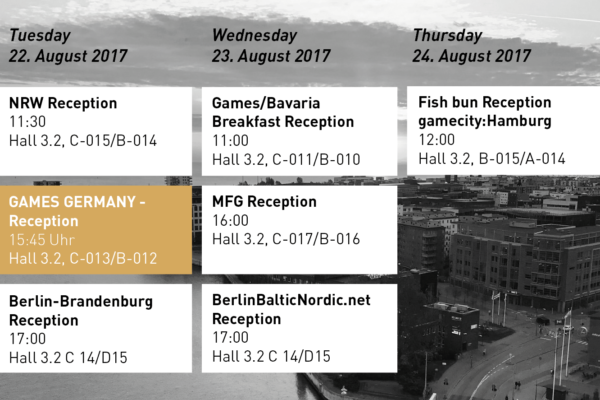 “Games Germany – Regional Funds and Networks” reception: Tuesday, August 22nd, 2017, 15:45, “Made In Germany” Area. During a reception at the world’s largest games fair gamescom in Cologne “Games Germany – Regional Funds and Networks” (GG) will officially start. Petra Müller, Head of the Film- und Medienstiftung NRW will give a short introduction before the networking starts. You are all cordially invited to join us for this occasion right in the middle of the “Made in Germany area”, in Hall 3.2 B-013/C-012 in the business area.